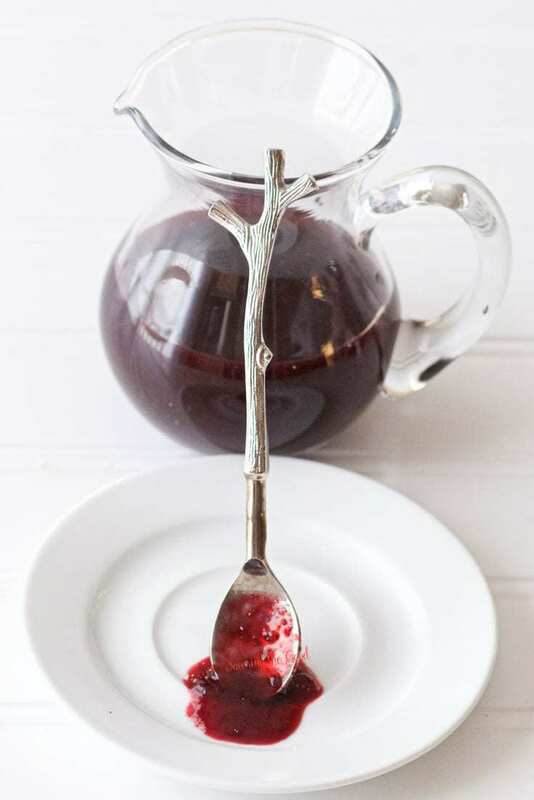 Cherry Syrup Recipe | This cherry syrup recipe is grain free, gluten free and vegan. Make this 4 ingredient cherry syrup recipe at home. In less than 20 minutes you will have homemade cherry syrup to serve alongside cheesecake, in cocktails or as a topping for pancakes. This cherry syrup recipe is grain free, gluten free and vegan. If you love cherries as much as I do you are going to want to make my recipes for cherry clafoutis, sour cherry pie filling and pectin free cherry jam. Cherry season is so short so I try and get as many cherries as I can. I will make bourbon soaked cherries for Manhattans, a few extra pounds so I can make a few batched of cherry pie bars and dry some for almondina pistachio and dried cherry crisp thins. How do you make cherry syrup? Combine the cherries, pinch of salt and sugar in a medium sauce pot. Allow to rest for 20 minutes. Add the 1/2 cup water and lemon rind to the cherries and sugar. Over medium heat, dissolve the sugar in the cherry syrup. Optional step: with an immersion blender, carefully pulse the cherries a few times to make a smoother, thicker syrup. Temporarily remove the lemon rind if you choose to blend. Return the lemon rind to the syrup for the thickening boil. Bring to a rolling boil, stirring every few minutes until a boil is achieved. Reduce heat to medium. Cook 10 minutes while stirring frequently to prevent scorching. Remove lemon rind. Syrup will thicken slightly when cooled. Cool completely and store in air tight containers in the refrigerator. What types of cherries can I use to make cherry syrup? This recipe uses bing cherries but I have also made cherry syrup with royal Ann cherries as well as tart cherries. Each cherry variety will give you a different flavor profile for your syrup. Feel free to combine different varieties of cherries for your own unique cherry syrup blend. Can you freeze cherry syrup? Yes! Cool the cherry syrup completely and transfer to freezer save containers. Leave 1/2 inch head space for freezing expansion. Use within 6 months. Water bath canning instructions for cherry syrup. Make cherry syrup as instructed. Using a jar lifter, place the jelly jars back into the canning pot. In this recipe I use the rind of a lemon to thicken the cherry syrup. To maintain a gluten free, grain free, vegan recipe I use the natural pectin in the white part of the lemon to thicken the syrup. Many fruits naturally have pectin in them. With genetically modified produce, often the pectin is less than would naturally occur. Lemon rind, the white part and the yellow outside, have a higher concentration of pectin than the juice. By using the rind of a lemon in jam, it will naturally thicken the jam by the pectin being extracted through boiling. An organic lemon would be a good choice for this project. dollop on top of cheese cake. Be sure to try my sous vide cheesecake! We are the new owners of a snow cone machine and this cherry syrup is so much better than the fake sugary ones sold for it! My husband is a big fan of the flavor of cherries and since we’ve given up soft drinks I bet he’ll love this with club soda! Excited to stockpile and freeze this syrup too! This is a great alternative to soft drinks! Use as much or as little as you need. YEAH!!!! I am so glad you think so! If using the lemon rind for thickening, what exactly do you do with it? Leave it in big pieces and then remove it? Grate it so it’s mixed in well? Remove it after the 10 minute thickening cook OR if you want to pulse the syrup….remove it to pulse and then place the rind back it for the remaining cook. Thanks for the question. I will update the recipe to be more clear.